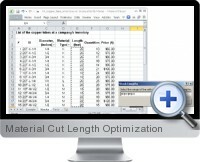 Material Cut Length Optimization for Excel calculates the optimal cutting lengths of raw materials in order to utilize the maximum amount with the least waste. The main purpose of Material Cut Length Optimization for Excel is to find how to cut linear raw materials (bars, pipes, beams, wires, etc.) in order to minimize the material waste and resulting production costs. A common approach taken in construction is to cut largest length of raw materials first and then smaller ones in order to reduce waste. This approach is not necessarily optimal and on average 10-20% of the material is wasted. Material Cut Length Optimization for Excel not only calculates what quantity of available sizes need to be ordered, but also how they should be cut to minimize the waste. Material Cut Length Optimization is an Excel add-in for Excel 2003 and higher and requires Microsoft .NET Framework version 2.0 or higher.